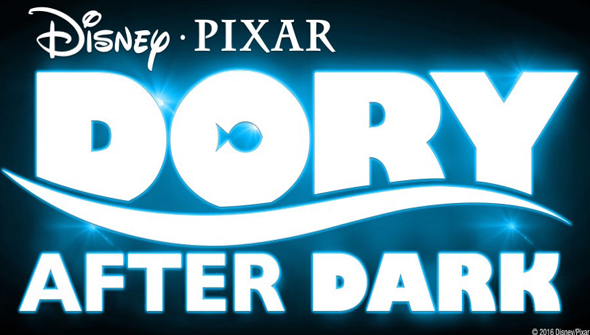 Guest Contributor Sarah Barrick reports for AFA on Pixar's Dory After Dark event. Pixar's newest film debuted Thursday, June 16 in select theaters as part of Dory After Dark, a one night only double-feature event. 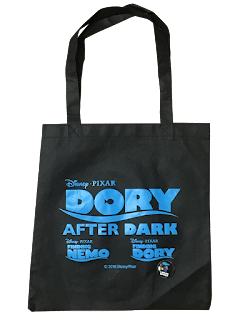 Attendees were treated to some Finding Dory swag (if you were in attendance, then your mileage may have varied. 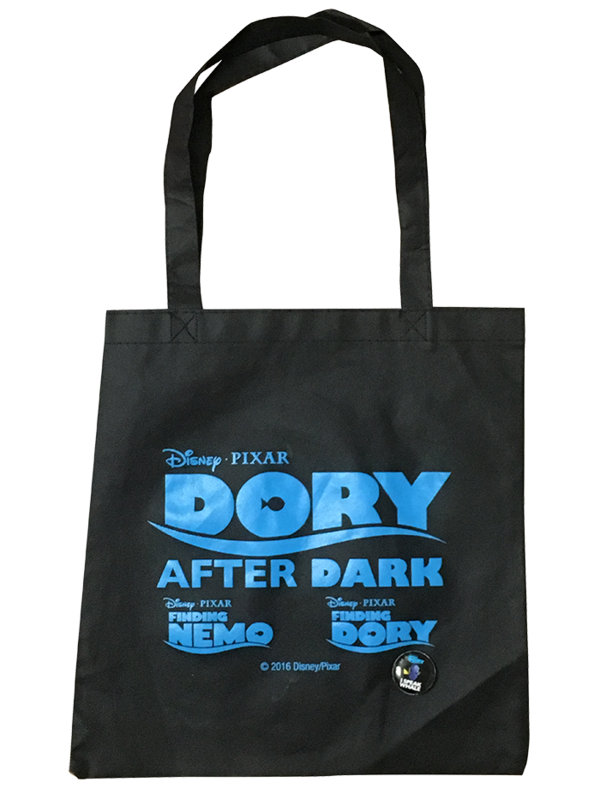 My local Cinemark was low on quantity and quality of film swag, but if you were able to go to a larger theater, for example the El Capitan in Los Angeles, CA, you would have experienced noticeably more fanfare – ahead of the Finding Nemo and Finding Dory double-feature. True to form, an original short preceded each Pixar film; the first half of the night kicked off with Pixar's Toy Story Toons: Partysaurus Rex (2012). (For those of you who haven't seen Partysaurus, you can enjoy it here: Toy Story - Partysaurus Rex). A laugh-inducing 6 1/2 minutes, Partysaurus finds Andy's toys once again co-conspirators in a string of hilarious mishaps with Bonnie's toys, this time with Rex at the helm. Tired of being labeled a "party pooper", Rex tries to prove just how much fun he can be when the toys find themselves high and dry in the bathtub after Bonnie's bath, wishing the fun didn't have to end. Adults and children will appreciate the humor, with jokes and one-liners for all ages (the entire theater roared when Rex sinks to the bottom of the tub wearing a Viking helmet and neon hair ties, greeting the non-floating bath toys with a barely subtle "WHAT UP FISHESSS?!?"). As the credits rolled on Partysaurus and the house music thumped, the audience began to settle in popcorn-munching contentment: at last… the first film of the night! A Pixar animated classic that needs no introduction, Finding Nemo is every bit as funny and delightful now as it was when it first debuted on the big screen 13 years ago. It's a rare treat to be able to watch old favorites up on the big screen, even a full decade after their release, and I believe that it was this opportunity that helped make Dory's opening night so popular. Animated films have always had a sort of special life and magic to them, often made even more special when we get to experience them larger than life. Of course at such an immense scale, details that are easily overlooked on a home television can become more apparent – especially as time has passed and animation technology has advanced by leaps and bounds in the past decade. While the quality of the animation and the appeal still remain, I couldn’t help but notice the almost inorganic feel of the characters; the models appearing more rigid, less supple and lifelike than I recalled. In contrast to the quality of animated feature films being released today, Nemo was akin to a high-quality student film rather than a multi-billion dollar studio production. While still an old favorite, Nemo puts into perspective just how much growth the animation industry has undergone, both in its production quality and technological advancement. As the credits rolled on the first film, a large portion of the audience shuffled their way out of the auditorium to Robbie William's soulful crooning of "Beyond The Sea" - bellies bloated from their first round of family-size popcorn tubs and jumbo ICEEs. Piper is a 6-minute foray into the trial and tribulations of a Sandpiper hatchling's first experience with the ocean. In a Pixar short first, the use of shifting depths of field allows the viewer to have, at times, a macroscopic perspective of the events, thus shrinking the viewer down to Piper's size and perspective. Subtle shifts in perspective give this short an almost National Geographic feel, at times making Piper look real. The quality of the render of the ocean's waves, and the sandy beach, each minuscule grain of sand distinguishable, further lend themselves to the film's unprecedented level of realism. Viewers will find themselves transported right into the foam and rolling waves alongside Piper, in what is sure to be Pixar's next Oscar winning short. After experiencing the level of quality and technical accomplishment that is Piper, the bar has surely been raised in the expectation of quality on both Finding Dory, as well as Walt Disney Animation Studio's upcoming water-centric feature film, Moana. Much like it's predecessor, Finding Dory is a film with family and perseverance at its heart. And it's not just about the family you're born into, but the family you choose. Unlike Nemo, however, this film takes a deeper dive into the subject of living with a disability, in a way that's even more enmeshed in Dory's story than his lucky fin was to Finding Nemo. Throughout the film, Dory (played by Ellen DeGeneres) struggles with her short-term memory loss as she tries to make her way back home to find the parents she lost. While Nemo (played by Hayden Rolence) and Marlin (played by Albert Brooks) play significant roles in the film, spending the majority of their time keeping up with Dory and her often-unpredictable decision-making, the story focuses primarily on how Dory, and other residents of the institute, cope with their respective disabilities. While Dory has all the ingredients of another Pixar hit with a multi-million dollar opening weekend (fantastic animation, heartwarming storytelling, lovable characters and a few poignant moments – and I’ll still be rocking my “I Speak Whale” pin! ), it does not have the level of originality of its predecessor Finding Nemo. In this reviewer's opinion, as far as Pixar sequels go, Finding Dory is about on par with Pixar's Cars 2 - brilliant for younger fans and family audiences, but doesn't have the uniqueness of concept for the more critical animation fan. Finding Dory is sure to be a family favorite, but may have stiff competition this coming awards season with other potential blockbusters: Disney's Moana, or Laika's Kubo and the Two Strings, possibly being strong contenders.